There are a growing number of muralists in the Bay Area like Ernest Doty, David Polka, Cannon Dill and Brett Flanigan that are working in new styles that marry technical aspects of graffiti with a range of other influences, from fine art, illustration and graphic design. 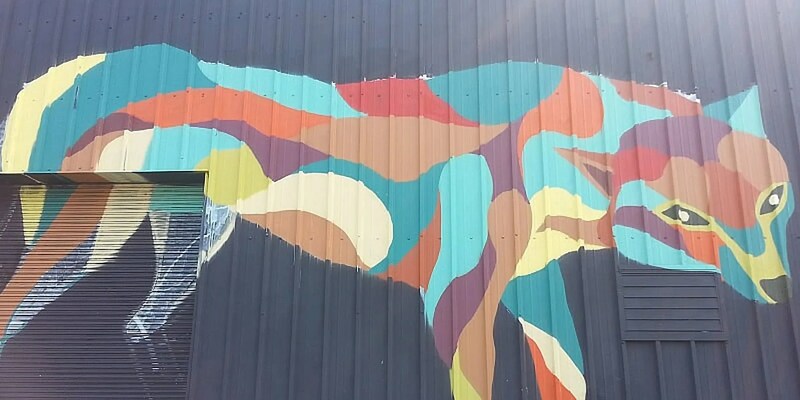 These artists frequently paint large scale murals without compensation, donating time and resources in exchange for the opportunity to engage a wider audience with their art. A project near our office in the Fruitvale district of Oakland was of particular interest to us. On a 400 foot long corrugated wall at the Norton Factory Studios a crowd-funded public art project went up with a goal of transforming the environment and facilitating the growth of public art initiatives. The project was funded through a public Kickstarter campaign. Oakland is a city rich with contrast. You find abandoned buildings and foreclosed homes side by side with new luxury lofts. Among the symptoms of the economic downturn, urban blight is one of the most readily apparent. Overworked and underfunded municipal services struggle to deal with widespread illegal dumping, graffiti, and general decay. These conditions present opportunities to create public art that improves the appearance of the community and adds cultural value.